Lily Munster is the ultimate undead housewife. 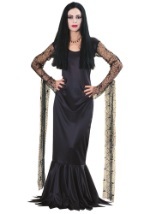 This Lily Munster costume includes a dress and wig. 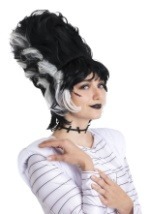 The wig is made of black and white synthetic hair. The hair is attached to a wig cap to allow for easy breathing. The dress is made of pink polyester that has a velvet feel to it. The neckline features black detailing and the center of the dress features black polyester detailing along with a black ribbon that goes down the center of the dress. The sleeves are made of pink tulle and feature jagged edges. Go to the party with someone dressed in our TV Herman Munster costume for a cute, unique, and freaky couples costume.